Winfield Scott Hancock (1824-1886) and his twin brother, Hillary were born in Montgomery County, Pa., February 14, 1824. General Hancock distinguished himself in many battles of the American Civil War. At Gettysburg (1863) he was in sole command until the arrival of General George Meade, and, in command of the left flank and later of the center of the Union troops, he was largely responsible for stemming the main Confederate attacks. 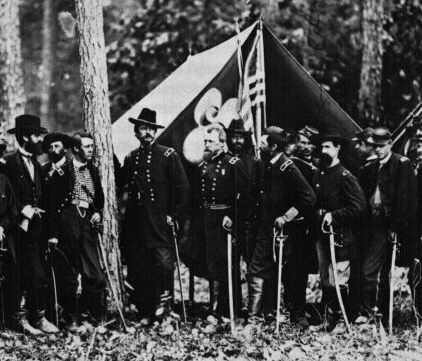 In 1864, Hancock was especially prominent at the Battle of the Wilderness, at Spotsylvania Court House, and at the Battle of Cold Harbor; in that year he was made brigadier general of the regular army. Although named for America's top military hero of the day, Winfield Scott Hancock was not originally intended for a military career; nevertheless he was destined to become one of the best corps commanders in the Union army. An 1844 graduate of West Point, he had served in the infantry during the Mexican War with distinction before transferring to the quartermaster's department. His Civil War assignemts included: Captain and Assistant Quartermaster (since November 7, 1855); Brigadier General, USV (September 23, 1861); Commanding 3rd Brigade, Smit's Division, Army of the Potomac (October 3, 1861-March 13, 1862); commanding 1st Brigade, 2nd Division, Fourth Corps, Army of the Potomac (October 3, 1861-September 17, 1862); Commanding 1st Division, Second Corps, Army of the Potomac (September 17, 1862-January 24, 1863 and February 20-May 22, 1863); Major General, USV (November 29, 1862) Commanding a Corps (May 22-July 1, and July 2-3, 1863 and March 24-June 18 and July 27-November 26, 1964); Major and Quartermaster (November 30, 1863); Brigadier General, USA (August 12, 1864); Commanding First Veteran Volunteer Corps (November 27, 1864-February 27, 1865); Commanding Middle Military Division (February 27-June 27, 1865); Major General, USA (July 26, 1866). Fearing that he would be left to sit in California, where he had been instumental in frustrating the plans of local secessionists, while the war raged elsewhere, he was ordered East for quartermaster duties but arrived to a brigadier's star. Taking his brigade to the Peninsula, he led a critical flank attack at Williamsburg and earned the sobriquet "Superb". He continued to distinguish himself during the rest of the dismal campaign. During the battle of Antietam, Israel B. Richardson was killed and Hancock was sent to command his division in the 2nd Corps, thus this beginning an historic association. At Fredericksburg his division took part in the costly assaults on Marye's Heights and at Chancellorsville he skillfully covered the Union withdrawal. With corps commander Darius Couch's request for transfer accepted, Hancock stepped up to the Second Corps leadership. With the fall of John F. Reynolds early on the first day at Gettysburg, Mead dispatched Hancock to take charge of that wing of the army and decide wether the battle should be fought there or not. This was a high honor since Oliver O. Howard, a senior officer, was already on the field. Belatedly he received the Thanks of Congress for this action. On the second and third days of the battle Hancock directed the Union center until wounded by a nail and by wood fragments - possibly from his saddle - driven into his thigh by enemy fire. A long recovery followed during which he performed some recruiting duty. Returning in time for the Overland Campaign he fought well at The Wilderness and was brevetted Major General in the regular army for his crashing through the Confederate salient at Spotsylvania. At Cold Harbor his troops were slaughtered in a futile assault ordered by Grant. Arriving on the Petersburg front, because of a lack of knowledge of the situation, he deferred command to the Corps commander on the field who failed to launch a final assault, which could very well have ended the war ten months earlier. Shortly afterwards Hancock's old wound broke open and he had to leave the army for a time. Returning, he was humiliated by the defeat at Reams' Station and in November was forced to give up field command; he began recruiting the first Veteran Volunteer Corps. Results were poor and early in 1865 he took over command in Washington D.C., Maryland, West Virginia, and the Shenandoah Valley.